1. LEARN THE MOVES. Each chess piece can move only a certain way. For instance, a pawn moves straight ahead but can only attack on an angle, one square at a time. A knight’s move is L-shaped. The bishop moves at an angle but can move more than one square at a time. The rook (castle) can move only in a straight line but can go forward, back or to the side. The queen, the most powerful piece, can move in any direction for any number of squares, but not two directions in one move. And the king moves at a stately pace — as a king should — one square at a time in any direction. 2. OPEN WITH A PAWN. Move the pawn in front of either the king or queen two squares forward. (Only on its opening move can a pawn move two squares.) This opens pathways for your bishops and queen to enter the game. They move on an angle and can’t get out onto the field of battle if pawns are in the way. 3. GET THE KNIGHTS AND BISHOPS OUT. Before you move your queen, rooks or king, move your knights and bishops toward the center of the board. You want to get these pieces out from behind the pawns so they can attack. 5. DON’T WASTE TIME. Don’t make too many moves with your pawns or try to pick off your opponent’s pawns. 6. “CASTLE” EARLY. Castling is a move that allows you to move your king to safety and bring your rook into play. Once all the squares between your rook and the king are unoccupied you can move the king two squares toward the rook while the rook moves to the square on the the king’s other side. If your opponent neglects to castle, you might be able to launch an attack on his king. This is the only move in which more than one piece may be moved in a turn. 7. ATTACK IN THE “MIDDLEGAME.” After you’ve brought all your knights and bishops into the game and castled (these moves are your “opening”), the middlegame begins. In the middlegame, always be on the lookout for ways to capture your opponent’s men. Take any piece that your opponent doesn’t protect. But look at what will happen to your piece if you take his — will you get picked off? Always be looking for ways to move lots of your men into position to attack the enemy king. 9. DON’T PLAY TOO FAST. If you see a good move, sit on your hands and look for a better one. 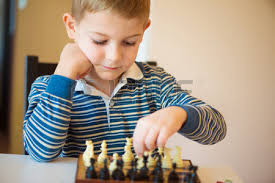 Patient thinking is the key to chess success. 10. WIN THE ENDGAME. After you and your opponent swap pieces and you’re down to just a few men, the endgame begins. Now the pawns become more important. If you can advance a pawn to the farthest row away from you, that pawn becomes a queen. A big success! Let your king attack, too, as long as he stays out of reach of your opponent’s remaining pieces — especially the queen — and does not let himself to be checked. get relaxed from your draw! HI GUYZ!!! UNLIMITED OFFER FREE OFFER FOR 1 YEAR.ENJOY YOUR UNLIMITED OFFER OF USING OF OUR WEBSITE.ENJOY// LEARN AND PLAY!! !